There are precisely one billionty video games out there that ask you to imagine what it would be like to survive the zombie apocalypse. But it's rare to find one that makes the setting feel like anything more than just morbid fun or creepy explorations. It's hard to inspire genuine, adrenaline-rushing fear. The kind of fear where you're playing not for the multiplayer, the challenge or the completionist gamer in you, but to actually survive. And when I was rushing into the outstretched hands of some fellow survivors back at our base in Dying Light, zombies trailing behind me, I felt the kind of relief you can only know after a true rush of fear. We already know a little bit about Dying Light. We know it sounds a lot like Dead Island with some elements of parkour in it. And we've been told that the day/night cycle makes a big impact on how you'll be playing the game, but we haven't seen too much of just how terrifying that can get. A lot of the 12-minute chunk of gameplay we've seen from developer Techland was set during the daytime, and most of the nighttime run was played out in stealth, which is certainly an option if you can avoid the rotting eyes of your infected enemies. But it's not easy and it's usually short-lived. When I started my demo of Dying Light over the weekend at PAX Prime in Seattle, the sun was still shining. I was getting the hang of jumping over crates, sliding under planks of wood and leaping off of zombies' heads (you get one stamina bar for running and one stamina bar for any major actions like the leap, a charged attack or dropkicking a zombie). The infected were slow, but get close enough and they'll certainly bite. You have a similar defense mechanism as you did in Dead Island: you can whack a zombie in the head with a constructed melee weapon or kick them backwards to make some room between you. And just like in Techland's previous zombie franchise, enemies are pretty tough to take down. You'll need to focus on dealing damage to their craniums to get anywhere. Though a neat addition in Dying Light is that you can grab and toss the zombies aside before they grab you. But I wasn't in Dying Light's fictional city of Hiran to toy with zombies and scale small buildings for practice. I was there to set up the perimeter. I rigged a car that I could remote control to set off an alarm that would distract nearby zombies should I need it. I powered up fences to send out bolts of electricity at my cue and I flipped the switches needed to turn on various lights in the nearby area. I was preparing for nightfall. Just before the sun completely set, I saved a guy barricaded inside his building. I'm told that each time you help the helpless randomly peppered throughout the city, you'll start to gain a reputation, making it easier to get people to trust you and therefore help you out when you need it. You can get discounts on weapons and even special abilities to level your character. Once the traps were armed and ready to be triggered in a pinch, I began my scramble back over to base. It was getting dark, and the zombies' grunts were getting more deliberate. Off I ran. I had no idea what I was running into. Half the time I'd run into a dead end and the other half I'd jump off a rooftop only to realize, wait, there are now four separate swarms of zombies all turning their attention towards me. I'd throw about five grenades in my panic—these ones were basically firecracker distractors—before remembering that I only have a limited number of those and should probably not succumb so quickly to my anxiety over potentially dying in a virtual world. Then I'd shine my flashlight against the face of the nearest neck-biter to daze him before jumping on top of a car to make my escape. It's safest on higher ground, but at night some zombies can climb just as well as you can. Once night fell, my time with Dying Light became a frantic and frankly messy dash to safety. It basically resembled an energetic but drunk person's adventures home, but instead I was making my way towards the yellow indicator on my map that tells me it's a spot where I won't die. If my feet could move independent of one another in video games, I might have been tripping over them, hastily making a decision to turn right when I initially looked left. So there I am, the zombie aggression meter on my display throbbing a blood red, I'm stumbling to climb walls and trying not to stop to confront any of these aggressive zombies. Once you stop at nighttime, you're pretty much assured to end up sprawled out on the floor, looking up at a narrowing circle of zombies hungry for your face flesh. So every nearing arm grasping at your shoulders is a terrifying prospect. You have to keep your feet moving, jumping, launching, anything but stopping. Occasionally I ran into a zombie who was a little distracted with the amount of blood gushing out of him. It's another sign of imminent danger, because I know this means he's turning into his night form. Night form, aka filled with murderous intent and energy form. I was just about out of breath when I reached one of the traps I set up earlier, and could activate it as a fail-safe. Phew. I finally got a little bit of space to figure out what the hell I was doing. It's obvious that Dying Light is going to be a bit of a fumble when you first jump into its world. It'll take some getting used to the fluid controls of interacting with the city, including learning its layout. Once you learn how to properly plan and string movements together, the game looks professional. For a newbie like me, I was leaning more towards that energetic drunk guy I mentioned earlier. It almost felt like the infected's levels of aggression were enough to overpower my intelligence as a healthy-brained, non-blood-gushing human, but I suspect a little bit of familiarity will go a long way. 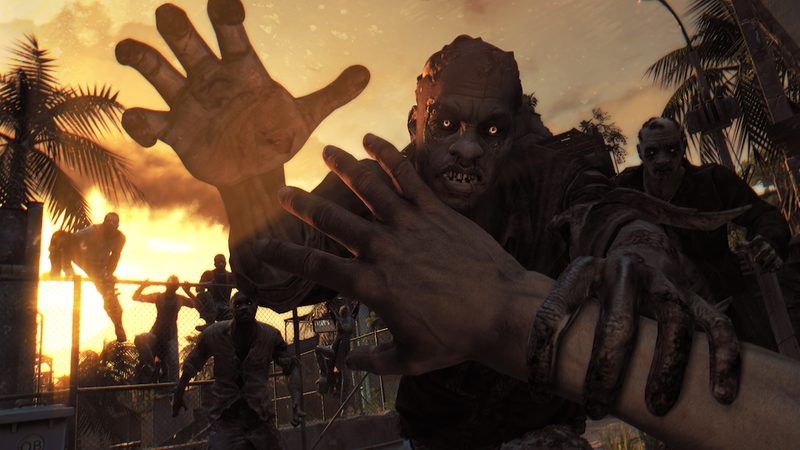 Dying Light will come out some time next year for Xbox 360, Xbox One, PS3, PS4, and PC.